Success and Growth in the U.S.
On Tuesday, April 24, UA students from the Capstone International Program’s 202: Introduction to Global Studies – Experiential Learning class presented videos highlighting their experiences with international students studying in UA’s English Language Institute (ELI). 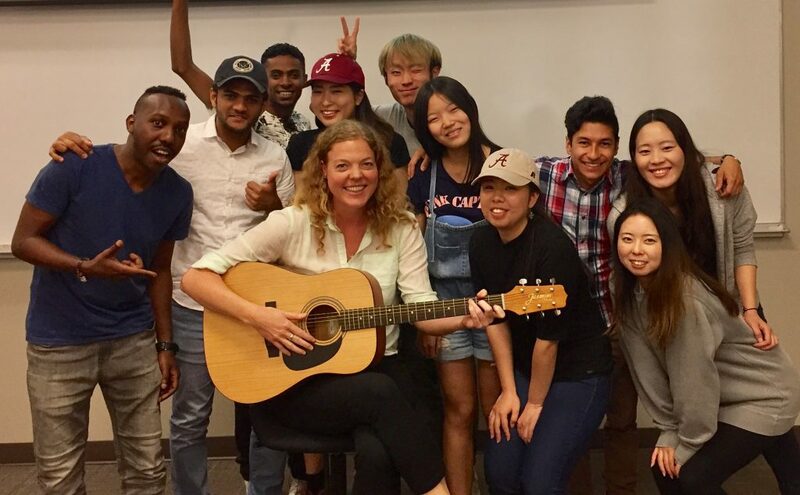 As part of the CIP 202 course, UA students participated weekly in ELI courses, with course topics ranging from Current Events to Top 40 American Music. In the courses, UA students developed their intercultural competence, the ability to communicate effectively and appropriately with people of other cultures, while working with students from 17 countries spanning five continents. The ELI students also benefit from the interaction with UA students. The ELI students share their cultural knowledge and expertise while learning more about U.S. culture and university life. The CIP 202: Introduction to Global Studies – Experiential Learning is an introductory course for The University of Alabama’s Global Studies Certificate. It sets the stage so that a student can approach all endeavors with an international perspective.